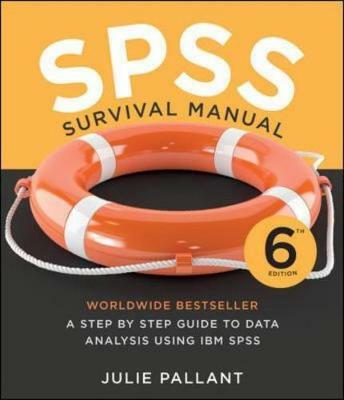 The SPSS Survival Manual throws a lifeline to students and researchers grappling with this powerful data analysis software. In her bestselling guide, Julie Pallant guides you through the entire research process, helping you choose the right data analysis technique for your project. From the formulation of research questions, to the design of the study and analysis of data, to reporting the results, Julie discusses basic and advanced statistical techniques. She outlines each technique clearly, with step-by-step procedures for performing the analysis, a detailed guide to interpreting data output and an example of how to present the results in a report. For both beginners and experienced users in psychology, sociology, health sciences, medicine, education, business and related disciplines, the SPSS Survival Manual is an essential text. Illustrated with screen grabs, examples of output and tips, it is supported by a website with sample data and guidelines on report writing. This sixth edition is fully revised and updated to accommodate changes to IBM SPSS procedures, screens and output. It covers new SPSS tools for generating graphs and non-parametric statistics, importing data, and calculating dates.